San Benedetto in Piscinula is an early 12th century church, heavily restored, in the rione Trastevere, just south of the south end of the Ponte Cestio. The dedication is to St Benedict of Nursia. Piscinula seems to refer to a small pond or pool. The wall structure and some capitals of the church reveal the existence of an oratory dating back to the 8th century. The first documented records date back to 1192. 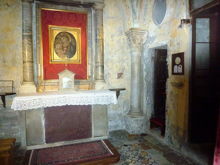 A narthex was added in the late 13th century, and the Chapel of Our Lady was set up next to the alleged cell of St Benedict. In 1412 the roof was replaced. 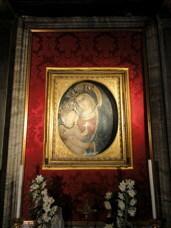 In the 16th century the apse was frescoed, and in 1678 a new façade was built. 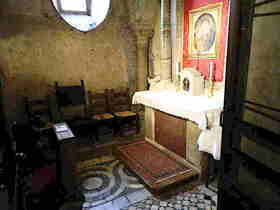 A new altar dedicated to St Anselm was provided in 1718. In 1728 the church was reconsecrated after the roof apparently failed and had to be repaired. 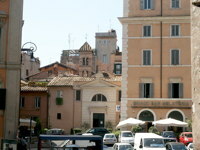 In 1844 a thorough restoraion project was carried through under the supervision of Pietro Camporese the Younger, who provided an entirely new Neo-Classic façade. Unfortunately the church fell into disrepair during the second half of the 20th century and was targeted by vandals and thieves. In 2003 the church was granted to the Heralds of the Gospel, a new Brazilian religious order which has carried out another thorough, badly needed restoration.